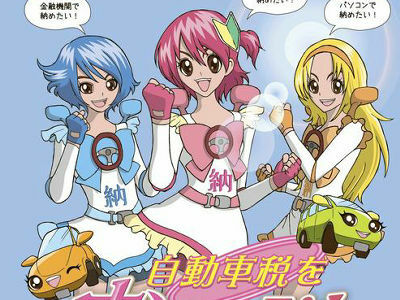 No, these aren't new members of Pretty Cure. 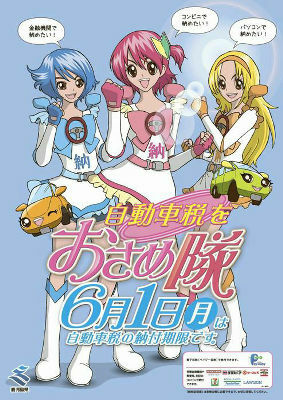 These are the original characters for Kagoshima Prefecture's campaign poster to remind vehicle owners of their tax. In Japan, vehicle tax is levied by each prefecture and since the period for tax payment is during May every year, many prefectures launch their campaign to prompt tax payment. Apparently, Kagoshima came up with a "pretty" tactic. They're called "Osame-tai" which can mean Team OSAME(the Chinese character "隊(tai)" stands for team) or I wanna pay tax. The beginner drivers' sign on her head, wing mirrors on the shoulder and steering wheel on the bow. 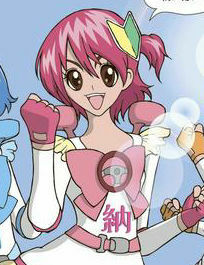 The Chinese character on her belly is "納(No)" that stands for payment in the word "納税(No-zay: tax payment)". Whether intentional or not, the striking resemblance to the popular anime has caught huge attention on the Internet. Not a bad thing if many people are reminded of their car tax.